I usually make chocolate truffles daifuku with milk flavored mochi until my sister-in-law told me of her favorite tiramisu mochi and it inspired me to add coffee to my mochi. And, oh-my- goodness… It’s sooo yummmy! Tip: Keep this particular daifuku chilled or the chocolate filling will soften. I suggest using a glove when making it if you have warm hands because chocolates can get pretty messy to work with. Heat cream in a heavy-bottomed saucepan until almost boiling; pour this over the grated chocolate. Let stand a minute before stirring until smooth. Cool at room temperature and chill in the refrigerator for at least 4 hours or firm. Put glutinous rice in a big bowl. Combine milk, sugar and coffee powder in a bowl or measuring cup, pour over glutinuous rice and mix until smooth- make sure it’s completely free of lumps. Cover with cling wrap and put inside the steamer. Steam for about 20 minutes. Dust potato flour on clean work surface; hands with some potato starch too. Remove the hot mochi from the bowl to the pan onto the dusted surface. Divide the mochi into 10-12 pieces by hands. Let the mochi cool completely before putting filling on so the truffles will not melt but cover the mochi with plastic wrap to prevent it from drying. When mochi is ready to use, flatten each piece and put one chocolate truffle in the center, and wrap filling by stretching mochi and form each into a ball and round the daifuku. 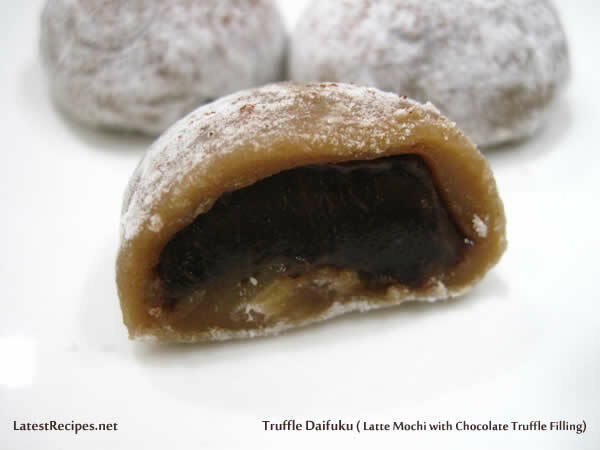 5 Responses to "Chocolate Truffles Daifuku ( Latte Mochi with Chocolate Truffles Filling)"
Olive!!!! How are you!!!! haven’t heard from you in a while 😉 I’m bookmarking this, i was looking for masi (Cebuano version of mochi but it has pounded peanuts w/ sugar for the filling) but i think i like this too. Will have to make this on my day off. Hope everything is okay at your end. Yum, looks delicious! Haven’t tried making mochi yet, but I think I will give it a try, thanks for sharing your recipe! I can practically imagine the wonderful taste of these. MMM, to enjoy these with an iced latte would be heaven.